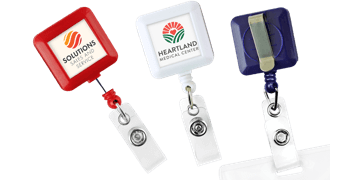 Our Badge Reels are a convenient way of securing your badge to yourself so that it's easily accessible. We offer a selection of strong, durable badge reels. Retractable cords make it easy to reach security access doors without unclipping. Personalise badge reels with company logo. Customise using our online designer.